Lying down on a Green Sleep mattress is heavenly. The feel of the organic cotton velour is luxurious and the natural rubber conforms to your body. 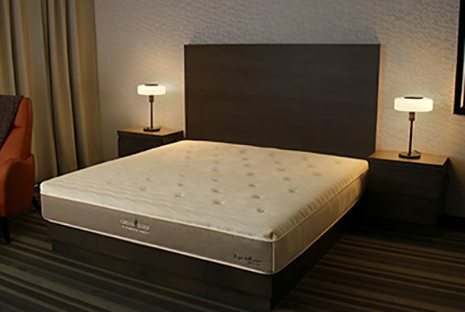 A Green Sleep organic mattress IS the definition of luxury, quality, and purity. We love selling these mattresses and were pleased that Marie, the owner of Green Sleep, paid us a visit last week. Marie has a wealth of knowledge. As we were discussing The Natural Sleep Store’s future with Green Sleep, I brought up a concern of mine, the ongoing push from customers for organic certifications on each raw material in a mattress. Marie explained that Green Sleep’s goal is “purity”, even more so than “organic”. Purity in the sense that materials come from the natural, undisturbed environment acquired in a way that promotes well-being and a sustainable partnership with the locals and the land that goes beyond the process of receiving an official ‘Certified Organic’ status. As mentioned in our past blog post on Green Sleep, the Green Sleep wool is unable to be certified organic, because the sheep are raised on Texel Island. They are allowed to roam free, thus the entire island would have to be certified organic in order to receive an organic certification on the wool. However, pesticides and herbicides are not used on the countryside of Texel, so in effect, this wool is organic, or, better than organic…. it is pure. Here is what makes wool from Texel superior: these are happy sheep, living the life a sheep should. According to Marie, some certified organic sheep farms these days keep the sheep in small pastures or inside in order to obtain the organic certification. As someone who has always been extremely concerned about animal welfare, this speaks volumes to me. I also asked why they could not get an organic certification on their latex foam. Green Sleep purchases their rubber from LSK Lamifoam. They have exclusive rights in North America, which means you cannot get this foam in any other mattress other than Green Sleep. LSK Lamifoam is located in northern Malasyia and supports the local economy. Independently owned small plantations are the source of the natural rubber milk. Each farmer collects latex milk from his trees and, with a couple of full baskets slung over his shoulders, will walk to the factory weekly to sell his yield. These small plantations are not organically certified as there are over 100 plantations that contribute and these small rural farmers could not afford to attain an organic certification, but again, pesticides and herbicides are not used in this area of the country. Marie said that they have been trying for years to find a second supplier of latex foam (it is a smart thing for any company to have at least two suppliers in case of emergency) but no one else quite meets their extremely high quality standards. They look for high levels of rubber (around 96% rubber) plus consistency in the firmness and sizing of the latex sheets, something they have found with LSK Lamifoam, but with no other latex supplier. Plus, after using this factory for over 20 years, they know this latex holds up to the test of time. This is a mattress that will last! The pursuit of harmony in the growing, raising and harvesting of materials that the company has sought-out and continually strives for, makes the Green Sleep brand a compelling choice for anyone looking for the next level of superior products. There are five things that distinguish Green Sleep from other organic mattress manufacturers. A Legacy of Purity. For over 20 years, Green Sleep has been intent on making the purest mattress possible. The value of having an organic certification means less to Green Sleep than their dedication to purity. Stability. They have used the same sources for over 20 years and know that they are consistent. You won’t get a mattress with anything less than top quality materials. Research. They continually do research by taking yearly trips to their suppliers, and even though they have maintained consistency over the years, are open to finding new suppliers in case a different raw material should be found that is superior. Exclusivity. Green Sleep is the only mattress you will find that uses their signature velour and LSK Lamifoam. Although sometimes rumored by other manufacturers that their velour is not 100% organic, they do have an organic certificate for this. And wow, beyond soft to the touch, it does feel like a little piece of heaven! People have tried to replicate their velour, but have not succeeded. Ergonomic design. These mattresses are made to have an ergonomic design that will provide the best support for your body. The best part is, it will stay this way, because through all of their research, and through the test of time, these materials will last! These distinguishing factors make choosing a Green Sleep organic mattress an investment in quality materials with purity that is second to none. Along with their trade insights, they deliver a superior product regardless of the presence of certificates. They take time to find out what is best and continue to improve. A Green Sleep mattress is an investment in a little bit of heaven, along with peace of mind that healthy, restful sleep is yours for years to come.